Joey Couch, who passed away at home Friday night at the age of 49, was known to most people for his football playing days at the University of Kentucky, where he earned All-SEC honors. But I remember Joey Couch better for his basketball playing days at Paintsville High School. He did help Paintsville football, coached by Walter Brugh, to a Class A runner-up finish to Crittenden County in 1985. But Couch got more state-wide exposure in hoops as a major contributor for the basketball Tigers, who played in the Sweet Sixteen in 1985, ’86 and ’87. Over those three years, Couch averaged a double-double — 13.2 points and 10.2 rebounds — in Paintsville’s six state tournament games in Rupp Arena. John Pelphrey got most of the headlines for those Bill Mike Runyon Tigers. Pelphrey was named Mr. Basketball after his senior season and went on to be part of the Unforgettables at UK. 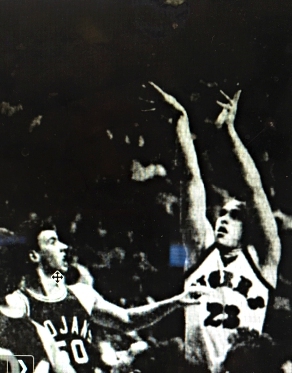 But Joey Couch, a powerful but nimble 6-foot-3, 215-pounder, was an integral part of those 15th Region three-peat teams that won 85 of 104 games. — 7 points/13 rebounds in a win over Owensboro in ’87. How good was Couch the basketball player? “As far as I’m concerned, he was probably the best football/basketball freshman athlete I ever coached,” Runyon said. “He was just phenomenal. “As a freshman, when he was a little thinner, he had every attribute. He could shoot it. He could handle it. He could pass it. He could play defense. He could rebound. He did a lot of things you just don’t see out of a freshman. In 1987, Paintsville made it to the Sweet Sixteen semifinals before losing to Ballard. A decade later, little ol’ Paintsville re-emerged as a state power. Led by J.R. VanHoose and Todd Tackett, the Tigers won the state championship in 1996, and were runners-up in 1998. Runyon said the great Paintsville teams in the 1990s never would have happened without the great Tiger teams in the 1980s. Joey Couch also set a standard for being a nice guy. He always seemed affable, approachable and ready to chat you up. “He always had a smile on his face,” Runyon said. When I last saw Joey and talked to him a few months ago, he had that ever-ready smile.